Creative Homes - Creative Homes Spring update! We’re incredibly pleased to be taking part in the Knee High Challenge, which is being run by The Design Council, with the support of the Guy’s and St Thomas’ Charity, to improve the lives of children under five. So far we’ve had the privilege to make it through two rounds of funding over the past 5 months, here’s a little bit about what we’ve been up! How do we reach new families? How do they want to engage with us? 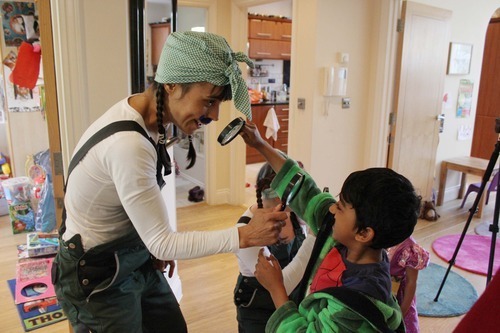 Can we create a service that can deliver Creative Homes to a group of families? So we approached Viridian Housing at the Church Manor estate in Lambeth, and the following week landed a garden shed in the middle of their playground. For the past month we’ve trilling our first “Hub to Home” program, inviting families to a communal space (in this case the shed), where we introduce small creative challenges designed to help them explore and enjoy their home in a new way. We’ve been pleasantly surprised to find that many families are also very happy to invite us into their homes and several lounges now host a well-used cardboard den. 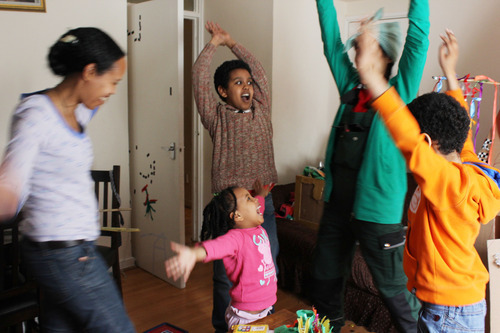 It’s provided us with lots of insight into family life on an over-crowded housing estate and allowed us to start testing out some really exciting new creative challenges together. Our trial ended on the 29th of March with a giant outdoor den build, a treasure hunt, and a picnic. We’ve also continued exploring how the Creative Homes service can work for families who approach us independently, through testing with another individual family. Our new family’s house was bursting with a miss mash of arts and crafts materials. 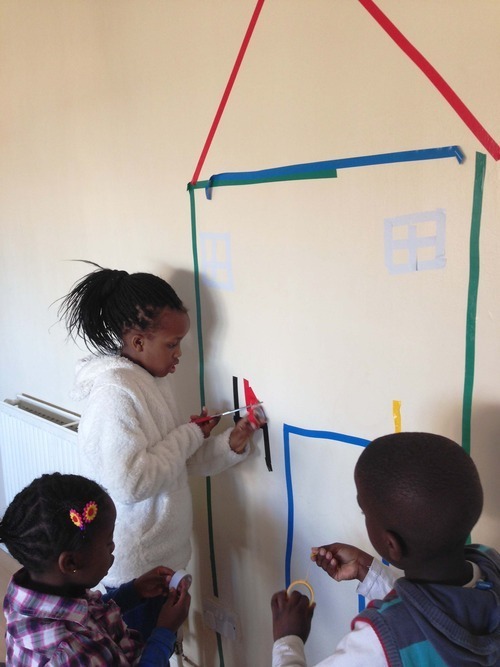 Unfinished projects, cardboard mountains and “clutter” created a barrier for the family to have fun creating at home together. So, we introduced the Clutter Inspector, who loves sniffing out creative clutter and has some very useful songs to help you collect, sort, store, create and display your creations at home. Lead by the Clutter Inspector and her team of T-Makers, the whole family got involved and it was great to see how quickly they transformed their space. The next step is to help them maintain a routine of de-cluttering with the help of the de-clutter kit and songs, as well as advise them on some creative ways to store and display their artwork and craft materials. Testing with another family has been a great way to improve our service of consultation, design and delivery, as well as develop a creative challenge that addresses a problem which many families face: too much clutter! We are realising that the role of the live artist is the most important part of our service and that scaling this up relies on recruiting and training the right artists as partners to drive it forward. We ran a workshop to test how we might train new artists and get feedback from a group of great creative people who were interested in the project. 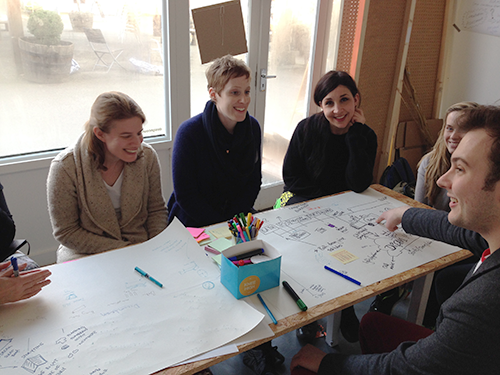 Apart from allowing us to meet some really great people that we hope to work with in the future, the workshop also helped us clarify how we communicate what Creative Homes is and understand what a new artist needs to know before they join. We’ve also been talking with potential partners and sponsors, including the Head of Dental at Kings College University Hospital, Real Nappies for London, Coin Street Community Builders and St. Giles Trust. We are looking ahead to developing relationships with the “gatekeepers” that surround our independent “hub” services. 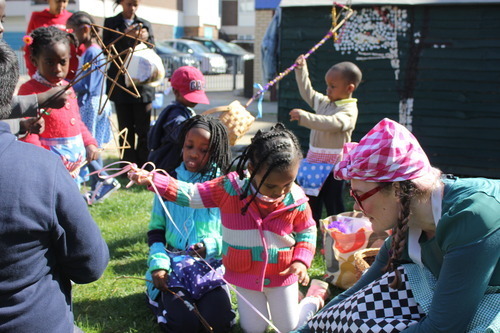 We hope that this will build sustainable programmes that look beyond the Creative Homes delivery and into the wider service of how we support families to connect into their communities. It’s been hard work but it’s been really rewarding to see the impact we’ve been having with families in their homes. Whether thats a den thats increased physical play and stops sibling rivalry before dinner, or helping a family to de-clutter, display and increased the quality of their play together. Most importantly we feel we are developing something “real”, that responds to individual family needs by just getting on and doing it. This service is developed by the artists and families. We’re really excited to continue finding our way together and achieve positive change through intensive and active collaboration.